Hey folks this is Scotty asking you to support the fest at the Kenny's GoFundMe. My set is Saturday May 25 at 1pm at the Greenwood Community Jazz festival at the Couth. Scot piano/vocal with Kenny sax and percussion. Come play or just enjoy. All ages all levels encouraged. 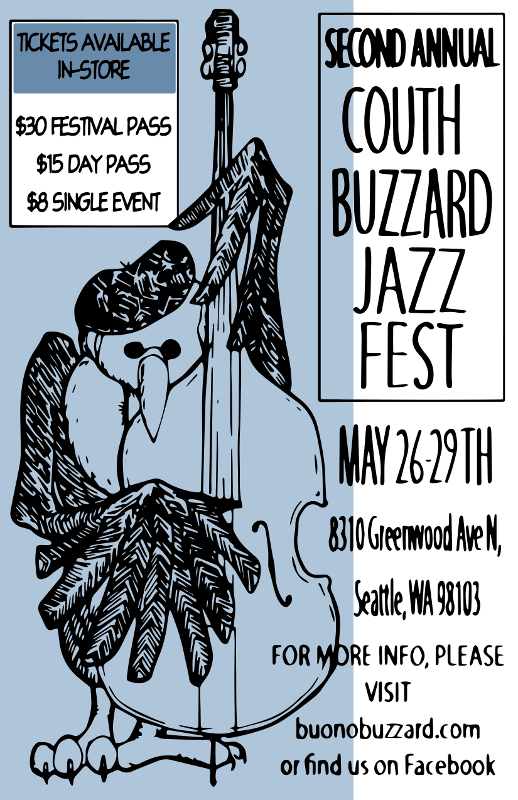 Coming this Memorial Day weekend: the triumphant return of the Couth Buzzard Jazz Fest! Thank you for making our first ever jazz festival such fun and such a success. Click here for news and updates, including the full schedule of performers. Description:SCOT FREE LIVE! Scot Lee/piano, Bob Morgan/drums, Buzz on bass, with special guest–John Mclandress/ trumpet. Save this date! Come see us early and have the evening for . . . a movie, staying for more jazz, or going home and . . . falling asleep! Where: Egan’s Ballard Jam House 1707 NW Market Street Ballard, WA 206-789-1621 Date: Saturday, May 31s- Time: 7:00 - 8:30 PM Doors open at 6 PM. Cost: $5 Cover Scot Free encourages you to come and support Egan’s. Egan’s is dedicated to providing a positive community-centered environment for jazz education and performance. Club owner Suzanne Weghorst, a virtual reality researcher at the University of Washington, was motivated to open Egan’s by the lack of appropriate places for young jazz musicians to play and to learn from more experienced artists. So come see us early and still have the evening for . . . whatever!